What did Malcolm Gladwell actually say about the 10,000 hour rule? A new paper out in Intelligence, from a group of authors led by David Hambrick, is getting a lot of press coverage for having “debunked” the 10,000-hour rule discussed in Malcolm Gladwell’s book Outliers. The 10,000-hour rule is — well, actually, that’s the point of this post: Just what, exactly, is the 10,000-hour rule? The debate in Intelligence is between Hambrick et al. and researcher K. Anders Ericsson, who studies deliberate practice and expert performance (and wrote a rejoinder to Hambrick et al. in the journal). But Malcolm Gladwell interpreted Ericsson’s work in a popular book and popularized the phrase “the 10,000-hour rule.” And most of the press coverage mentions Gladwell. Moreover, Gladwell has been the subject of a lot of discussion lately about how he interprets research and presents his conclusions. The 10,000-hour rule has become a runaway meme — there’s even a Macklemore song about it. And if you google it, you’ll find a lot of people talking about it and trying to apply it to their lives. The interpretations aren’t always the same, suggesting there’s been some interpretive drift in what people think the 10,000-hour rule really is. I read Outliers shortly after it came out, but my memory of it has probably been shaped by all of that conversation that has happened since. So I decided it would be interesting to go back to the source and take another look at what Gladwell actually said. Some Gladwell defenders have claimed he was just saying that talent isn’t enough by itself and preparation matters too. But that would be a pretty weak assertion for a bestselling book. I mean, who doesn’t think that violin prodigies or hockey players need to practice? And it is clear Gladwell is going for something more extreme than that. “Achievement is talent plus preparation” is not Gladwell’s thesis. To the contrary, that is the conventional wisdom that Gladwell is promising to overturn. So “a more complete picture of the path to success” says that talent exists and it matters — a lot. It is actually a big deal if you have a “gift of the sort that comes along once in a generation.” So we are actually back to the conventional wisdom again: Achievement is talent plus preparation. Sure, Gladwell emphasizes the preparation piece in his storytelling. But that difference in emphasis tells us more about what is easier to narrate (nobody is ever going to make an 80’s-style montage about ACE models) than about which is actually the stronger cause. So after all the stories, it looks an awful lot like the 10,000-hour rule is just the conventional wisdom after all. “Opportunities” doesn’t sound like talent *or* preparation. What’s that about? Only Gladwell wants his conclusion to be simpler than the conventional wisdom, not more complicated. So he tries to equate luck with preparation, or more precisely with the opportunity to prepare. Be born in the right era, live in the right place, and maybe you’ll get a chance to spend 10,000 hours getting good at something. The problem with simplifying the formula rather than complicating it is that you miss important things. Gladwell’s point is that you need opportunities to prepare — you can’t become a computer whiz unless you have access to a computer to tinker with (10,000 hours worth of access, to be precise). He notes that a lot of wealthy and famous computer innovators, like Bill Gates, Paul Allen, and Steve Jobs, were born in 1954 or 1955. So when personal computing took off they were just the right age to get to mess around with computers: old enough to start businesses, young enough and unattached enough to have the time to sink into something new and uncertain. Gladwell concludes that the timing of your birth is a sort of cosmically random factor that affects whether you’ll be successful. But not all opportunities are purely random — in many domains, opportunities are more likely to come to people who are talented or prepared or both. If you show some early potential and dedication to hockey or music, people are more likely to give you a hockey stick or a violin. Sure, you have to live in a time and place where hockey sticks or violins exist, but there’s more to it than that. And let us not forget one of the most important ways that people end up in the right place at the right time: privilege (turns out Macklemore has a song about that too). The year that Gates, Allen, and Jobs were all born in 1954-55 may be random in some cosmic sense. But the fact that they are all white dudes from America suggests some sort of pattern, at least to me. Gladwell tells a story about how Bill Hewlett gave a young Steve Jobs spare computer parts to tinker with. The story is told like it’s a lucky opportunity for Jobs, and in a sense it is. But I wonder what would have happened if a poor kid from East Palo Alto had asked Hewlett for the same thing. So now we are up to 4 things: talent, preparation, luck, and privilege. They all matter, they all affect each other, and I am sure we could add to the list. And you could go even deeper and start questioning the foundations of how we have carved up our list of variables (just what do we mean by “innate talent” anyway, and is it the same thing — innate in the same way — for everybody?). That would be an even more complete picture of the path to success. Not an easy story to tell, I know, but maybe a better one. 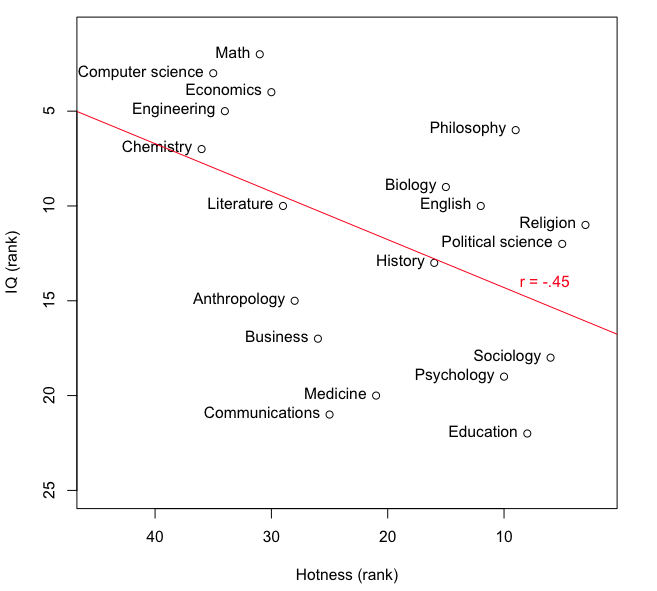 The other day I came across a blog post ranking academic fields by hotness. Important data for sure. But something about it was gnawing on me for a while, some connection I wasn’t quite making. And then it hit me. The rankings looked an awful lot like another list I’d once seen of academic fields ranked by intelligence. Only, you know, upside-down. Sure enough, when I ran the correlation among the fields that appear on both lists, it came out at r = -.45. I don’t know what this means, but it seems important. Maybe a mathematician or computer scientist can help me understand it. A new study by Timothy Salthouse adds to the body of work suggesting that raw cognitive performance begins to decline in early adulthood. News reports are presenting the basic age pattern as a new finding. It’s not, or at least it’s not new in the way it’s being portrayed. The idea that fluid intelligence peaks in the 20s and then declines has been around for a while. I remember learning it as an undergrad. I teach it in my Intro classes. So why is a new study being published? Because the research, reported in Neurobiology of Aging, tries to tease apart some thorny methodological problems in estimating how mental abilities change with age. If you simply compare different people of different ages (a cross-sectional design), you don’t know if the differences are because of what happens to people as they get older, or instead because of cohort effects (i.e., generational differences). In other words, maybe members of more recent generations do better at these tasks by virtue of better schooling, better early nutrition, or something like that. In that case, apparent differences between old people and young people might have nothing to do with the process of getting older per se. To avoid cohort effects, you could follow the same people over time (a longitudinal design). However, if you do that you have to worry about something else — practice effects. The broad underlying ability may be declining, but people might be getting “test-smart” if you give them the same (or similar) tests again and again, which would mask any true underlying decline. As a result of different findings obtained with different methods, there was a majority view among researchers that fluid performance starts to decline in early adulthood, but also a significant minority view that that declines happen later. What Salthouse did was to look at cross-sectional and longitudinal data side-by-side in a way that allowed him to estimate the age trajectory after accounting for both kinds of biases. In principle, this should yield more precise estimates than previous studies about the particular shape of the trend. Based on the combined data, Salthouse concluded that the early-adulthood peak was more consistent with the evidence. It’s understandable, but unfortunate, that the media coverage isn’t going into this level of nuance. Science is incremental, and this study is a significant contribution (though by no means the last word). But news stories often have a set narrative – the lone scientist having a “eureka!” moment with a shattering breakthrough that “proves” his theory. Science doesn’t work that way, but that’s the way it’s usually covered.